UK Release Date - 16th March 1992 (7"/12"/CASS). UK Release Date - 23rd March 1992 (CD Singles Box). US Release Date - March 1992. Producer - Mike Shipley And Def Leppard. Engineered/Mixed By - Mike Shipley (Track 01). All Programming And Sequencing By - Pete Woodroffe (Track 01). Executive Producer - Robert John "Mutt" Lange (Track 01). 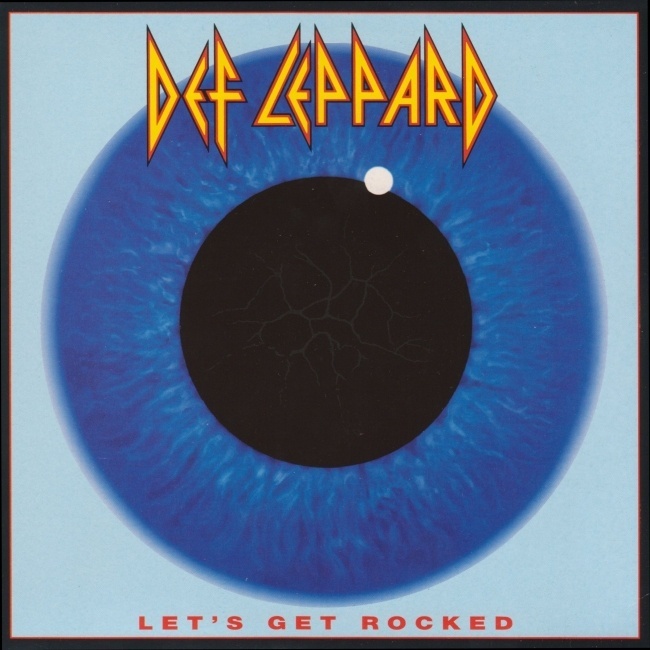 Producer/Engineer - Def Leppard (Track 03). Engineered/Mixed By - Robert Allen Scovill (Track 03). Assisted By - John Smit/Malcolm Harper (Track 03). Live Tracks 03/04 - Recorded 12/13th February 1988 in Denver, CO, USA. Wolf Whistle - Karla Elliott. Artwork And Design - Andie Airfix at Satori. US Record Label - Mercury. Special Formats - Limited Edition CD Singles 12 Inch Collector's Box. Four CD slots to make album cover. Special Formats - Limited Edition 12 Inch Picture Disc (not numbered). Special Formats - US Picture Disc Gatefold Card Sleeve Promo CD. The first single from 'Adrenalize' was released in March 1992. 'Let's Get Rocked' was the bands first single since 1989 and became their biggest UK hit so far reaching number 2 on the UK Top 40. Missing out on the top spot by only 146 copies. It got to number 15 on the Billboard charts in the US and was a major hit around the world also reaching the Top 10 in Australia, New Zealand and Switzerland. A number of different UK formats were released over 16th to 23rd March. Firstly the 7 and 12" singles. Followed by the CD versions. The 12" single was a picture disc, the first in a series of 5 that would be released from the album. Each featured cover artwork on one side and a band member promo pic on the reverse. This one had all four band members (from the album session - Joe/Phil/Rick/Sav) on the back - the promo shot from the back of the 7". The UK CD single was released without a jewel case but as part of a CD Singles box set. The box had space for four singles, each making up the four holes in the Adrenalize album cover. The first single formed the top left part. Two live tracks from the Denver shows of 1988 were included. 'Women', released for the first time in the UK and 'Too Late For Love', released for the first time anywhere. Other countries had the same single in a regular slimline jewel case. "You hold in your hands the first single from our new album, ADRENALIZE. A simple little ditty, Let's Get Rocked just about sums up our feelings about life. Also, check out Only After Dark, a Mick Ronson song we've always liked. Mick's been ill and this track is our acknowledgement to his importance...It sure feels good to be back. Play it LOUD!" The 'wolf whistle' in the song is actually done by Joe's then wife Karla Elliott as none of the band could do it as well as her.